Florence Eiseman knitted terry cloth swim coverup. 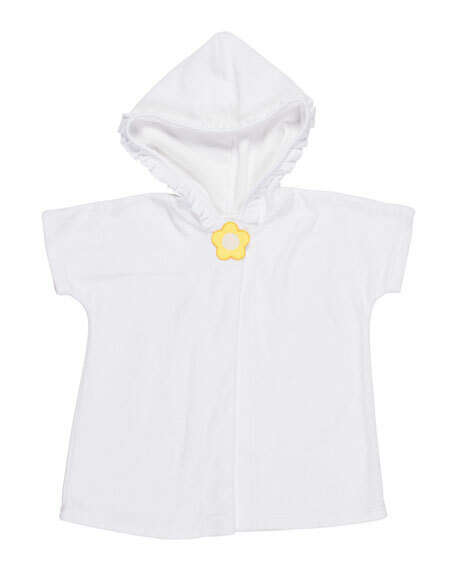 Hooded collar with ruffle trim around edge. For in-store inquiries, use sku #2432688. 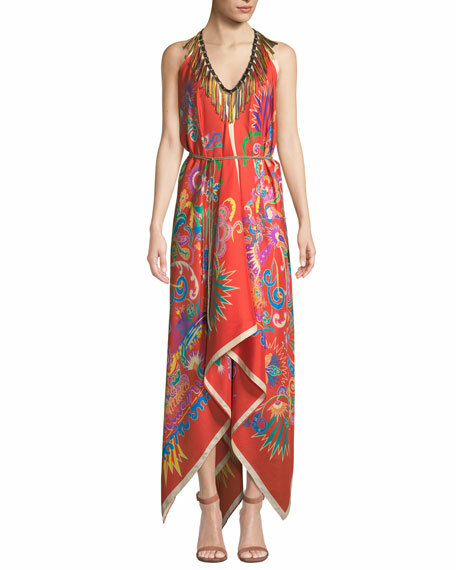 Etro dress in printed silk with fringed neckline. V neckline. Sleeveless. Self-ties at waist. Relaxed, straight fit. Maxi length. Handkerchief hem. Cotton/polyester/viscose belt. Acetate/polyester fringe. Made in Italy. 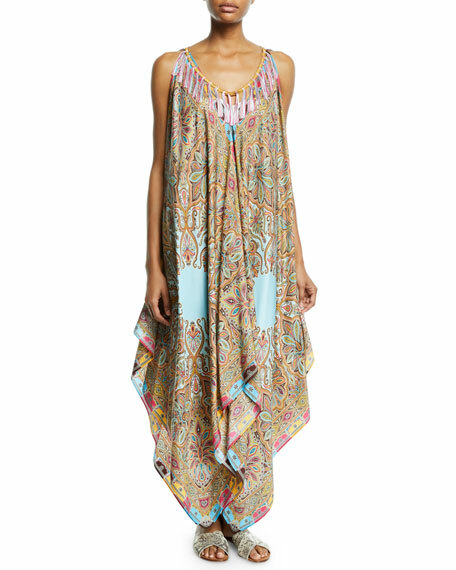 Etro printed silk coverup dress. V neckline; fringe details. Sleeveless. Shift silhouette. Maxi length. Handkerchief hem. Slipover style. Viscose/cotton, ribbon. Fringe, acetate/polyester. Made in Italy. 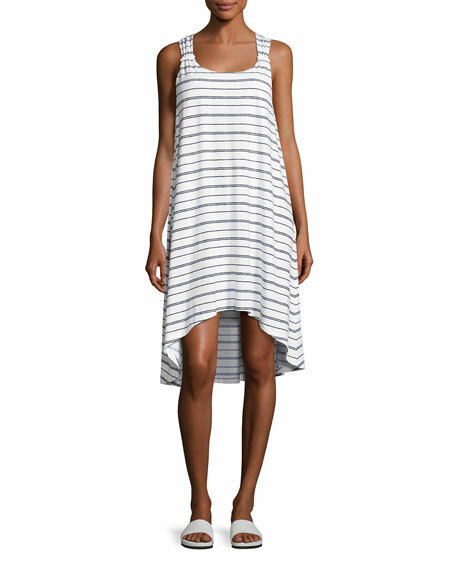 Heidi Klein "Nassau" striped poplin dress. Scoop neckline. Sleeveless. Built-in shelf bra. Twist back straps. Shift silhouette. Pullover-style. High-low hem. Cotton/modal/spandex. Imported. 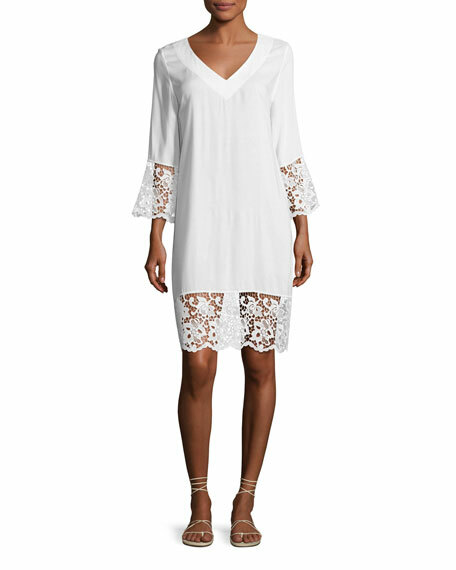 Lise Charmel tunic dress with floral guipure lace trim, from the Plage et Ville collection. Banded V neckline. Bracelet sleeves; slight bell cuffs. Shift silhouette. Scalloped hem. Slipover style. Viscose/polyester/nylon. Imported of French material.